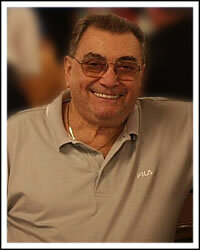 John Bonetti is one of poker’s oldest characters, having been born in Brooklyn in June of 1928. John did not start playing poker until he was 55, after being encouraged by a coworker when he moved from New York City to Houston, Texas. John won $30,000 in his first tournament, a finish that led him to become a professional poker player. John Bonetti has won three bracelets at the World Series of Poker, coming in 1990 in Deuce to Seven Triple Draw, in 1993 in Pot Limit Holdem, and in 1995 in Deuce to Seven Triple Draw. John Bonetti has also had strong finishes in the WSOP Main Event six times, including two 3rd place finishes. John Bonetti’s health has been a concern for a long period of time, as he was fighting prostate and spinal cancer since 1993. He defeated the cancer, but has been plagued by other health concerns and used a wheelchair to get around during his final years. John died in Houston, Texas on June 27, 2008.